These human warriors at the beginning are young alchemists who, banished from their native villages having broken the law or having practiced forbidden magic, are forced to live in the woods as fugitives. Ever wanted, they have to rob the travelers to survive. Living in symbiosis with nature, Exiles usually become druids. 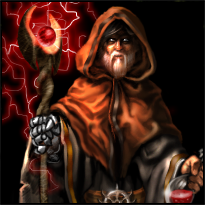 In addition to their extraordinary power, exiles are able to prepare potions and mixtures which can heal every type of wounds, including poison-based ones.The older ones acquire uncommon wisdom and knowledge. Some of them become powerful wizards able to use both fire and arcane spells with great skill, throwing fireballs and lightning bolts from their staffs, which are real symbols of their power. Last updated on Sat Apr 20 01:39:02 2019.